Eastwood Auto Body Ltd. is an Edmonton body shop that was was founded in 1962 with one goal in mind: to provide courteous, professional and unparallelled Collision, Refinish and Body Shop services to residents of Edmonton and outlining areas. Eastwood Auto Body was founded by Otto Barz in 1962 and has operated at the same location and by the same family for Fifty five years. Over the years, we have succeeded in becoming the number one body shop, auto refinish and collision repair service in the Edmonton area thanks to our ability to listen to our customers' needs and the sheer quality of our work. We are proud of what we can offer the Edmonton community, and that pride shines through every repair we undertake, big or small. Our experienced and skilled mechanics are devoted to making Eastwood Auto Body Ltd. the very best Edmonton bodyshop around. Their work is a reflection of our commitment to ensuring that every vehicle that comes our way is serviced thoroughly and with an unequaled attention to detail. Our priority is ensuring the satisfaction and safety of our customers, and we spare no effort to ensure that they are safely back on Edmonton's road in a timely and affordable manner. You have the right to have your vehicle repaired at a shop of your choice. When you select a shop, The resposibility for a satisfactory repair job rest, finally, with you. So it is in your best interest to shop carefully for a bodyshop. If the repair staff has journeyman certificates, that is one indication of their competence. Their equiptment should be up to date and in good condition. 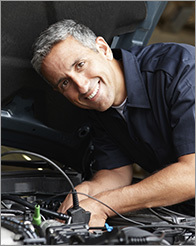 Be aware that specialized equiptment is needed to repair late model cars. Once you've chosen a body shop then call your insurance company. We accept all insurance company estimates and perform the workto the satisfaction of both the customer and the insuance company. We can also take care of the paperwork for you, and we can get you in a rental car to get you on your way. Eastwood Auto Body is an Edmonton autobody shop in which you can have confidence. We will never try to push work that is not necessary, and always take the time to explain exactly what is being done and why. If you are located in the greater Edmonton area and are looking for a trustworthy Edmonton garage that will efficiently service your vehicle within time and budget, look no further. Eastwood Auto Body is looking forward to hearing from you, and to getting you back on the roads safely and as quickly as possible.